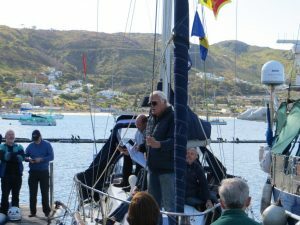 October 31st, 2018 we invited about 60 people to the christening of our small sailing yacht MARIAH. The weather played along nicely – no rain has been predicted, temperatures pleasant, and with about 20 minutes delay the ceremony started late afternoon. After some words of welcome to our guests and a thank you to all companies and persons involved in the renovation, Hans our carpenter took over. 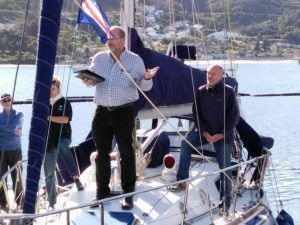 Hans revealed the development of the restauration and then handed over to our invited priest who did an impressive sermon followed by the christening of our boat. After this the fun part started: Richard opened a bottle of sparkling wine and sprinkled our boat while I wished MARIAH and crew bon voyage, fair winds as well as moderate seas together with the hope that all on board have the necessary respect for the elements as well as always a good seamanship. An invitation to have all together a drink and a good snack at Heather’s restaurant completed a really successful ceremony. All times a safe journey!